The present invention relates to a degradable resin composition. More particularly, the invention relates to a lactic acid base degradable resin composition which comprises a lactic acid base polymer such as polylactic acid or a lactic acid-hydroxycarboxylic acid copolymer and a ultra-violet absorber and/or a light stabiliser so as to improve the weatherability of the polymer. A lactic acid base polymer has been already known as a hydrolyzable polymer or a bioabsorbable polymer. For example, Japanese Patent Publication SHO 49-36597 discloses an auxiliary surgical tool obtained from a lactic acid/glycolic acid copolymer consisting of 65∼85 % by weight of lactic acid units and 35∼15 % by weight of glycolic acid units. Japanese Patent Laid-Open Publication 62-501611 discloses a medical transplanting material obtained from a copolymer of caprolactone and lactide, a cyclic dimer of lactic acid. Another known lactic acid/tartaric acid copolymer having degradability in the human body may be used for surgical articles and as a carrier or matrix for pharmaceutical agents (EP-A-0 426 055). It is mentioned that the same copolymer may be further used as a material for protecting sheets. Polylactic acid or a lactic acid/hydroxy carboxylic acid copolymer can be effectively hydrolyzed by atmospheric moisture and thus it has recently been suggested as a fundamental component of degradable general purpose materials for disposable uses other than medical tools. Various information has already been obtained on the hydrolysis rate of polylactic acid and a lactic acid/hydroxycarboxylic acid copolymer. It is hence relatively easy to design materials so as to meet degradation period required for disposable uses. For example, high molecular weight poly(L-lactic acid) is suited for a use period of about 6 months, and a lactic acid/glycolic acid copolymer is suited for uses where the use period is several days and quick decomposition is desired after use. According to the knowledge of the inventors, however, outdoor use of conventional materials prepared from lactic acid base polymers such as polylactic acid and a lactic acid/hydroxycarboxylic acid copolymer generally leads to distinctly faster reduction of strength as compared with indoor use or uses in a dark place or in the living body. It has been found that phenomena such as embrittlement. rupture and disappearance occur earlier than expected. For example a film which was expected to hold its strength for at least 6 months at ambient temperature in view of information on the rate of hydrolysis was embrittled after outdoor use for about a month and could not perform its function any more. Further, the rate of acceleration of the decomposition could not be anticipated at all and the decomposition period was diversified. As described above, earlier decomposition than the prescribed degradation period sometimes results in a serious problem for utilizing a lactic acid base polymer such as polylactic acid and a lactic acid/hydroxycarboxylic acid copolymer as a degradable material. Such problem is a great disadvantage which cannot be overlooked at all. GB-A-2 009 768 discloses a stabilised polyester composition which comprises (A) a specific polyester prepared from terephthalic acid, 50 to 99 mole % of 1,4-cyclohexanedimethanol, 1 to 50 % of a second glycol selected from ethylene glycol, 1,4-butanediol and 2,2-dimethyl-1,3-propanediol and (B) a stabiliser. The aim is an improvement of the resistance to weathering of the polyesters which can be achieved by using the second glycol mentioned above in a critical concentration range. The object of the invention is to provide a degradable resin composition the decomposition of which is inhibited and which as excellent weatherability primarily for outdoor use. The invention provides a degradable resin composition comprising 100 parts by weight of a lactic acid base polymer and 0.001∼ 5 parts by weight of one or more additives selected from ultraviolet absorbers and light stabilizers as defined in claim 1. Said degradable resin composition is prepared by mixing a lactic acid base polymer with a specific amount of auxiliary agents such as ultraviolet absorbers. The degradable resin composition of the invention is excellent in weatherability. Although the degradable product formed from the resin composition is used outdoors, the product exhibits the same degradation behavior as used indoors or in a dark place. The degradable product can maintain essential mechanical properties of the lactic acid base polymer during the use period and degrade after use on the basis of the essential hydrolytic properties, and is thus useful as a material of throwaway formed products which are mainly used outdoors. The present invention will hereinafter be illustrated in detail. The term "lactic acid base polymer" means polylactic acid or a copolymer of lactic acid with a hydroxycarboxylic acid. L- and D- Isomers are present in lactic acid. When referred to simply as lactic acid, the term means L-lactic acid, D-lactic acid or a mixture of L- and D-lactic acid unless otherwise noted. The molecular weight of the polymer means the weight average molecular weight unless otherwise noted. Polylactic acid which can be used in the invention includes poly (L-lactic acid) having structural units composed of L-lactic acid alone. poly(D-lactic acid) having structural units composed of D-lactic acid alone, and poly(DL-lactic acid) having L-lactic acid units and D-lactic acid units in an arbitrary ratio. The lactic acid/hydroxycarboxylic acid copolymer which can be used in the invention is prepared from lactic acid including the above various lactic acids and hydroxycarboxylic acids including glycolic acid. hydroxyacetic acid. hydroxyvaleric acid. hydroxycaproic acid and hydroxyheptanoic acid. Polylactic acid and the lactic acid/hydroxycarboxylic acid copolymer of the invention can be prepared by dehydration polycondensation of lactic acid or lactic acid and hydroxycarboxylic acid. Direct dehydration polycondensation includes a process for carrying out hot dehydration condensation of lactic acid or lactic acid and other hydroxycarboxylic acids preferably in a solvent and additionally conducting the reaction while removing formed water out of the reaction system. The homopolymers and copolymers of lactic acid can also be prepared by ring opening polymerization of lactide which is a cyclic dimer of lactic acid, glycolide which is a cyclic dimer of glycolic acid, and cyclic esters such as caprolactone, propiolactone, butyrolactone and valerolactone. Formed products of a lactic acid base polymer are degraded in water or soil after abandonment and are also hydrolyzed during use by atmospheric moisture or water. Consequently, the molecular weight of the polymer in the substrate film used is an important factor. Tensile strength of the film depends upon the molecular weight. Low-molecular weight decreases tensile strength and high molecular weight increases tensile strength. However, too high molecular weight lowers processability and makes film forming difficult. Consequently, the molecular weight of the lactic acid base polymer used in the invention is in the range of 10,000 ∼ 1, 000, 000, preferably 30,000∼500,000. In the case of polylactic acid, a sheet or film formed by extrusion or calendering is sometimes liable to lose transparency due to progress of crystallization when these products are subjected to heat treatment such as vacuum forming, pressure forming, vacuum/pressure forming and heat setting. Polylactic acid having 100 % by weight of L-lactic acid units or D-lactic acid units must be vacuum formed or pressure formed at relatively low temperatures such as 60∼90°C in order to obtain transparent products. Such a narrow range of processing temperature is a disadvantage. Consequently, poly(DL-lactic acid) comprising L-lactic acid units and D-lactic acids units is preferred for preparing transparent products rather than poly(L-lactic acid) consisting of L-lactic acid units alone or poly(D-lactic acid) consisting of D-lactic acid alone. The composition of polylactic acid which can be preferably used is poly(L-lactic acid) or poly(DL-lactic acid) which comprises 50∼100 % by mole, preferably 70∼100 % by mole of L-lactic acid and poly(D-lactic acid) or poly(DL-lactic acid) which comprises 50 ∼100 % by mole, preferably 70∼100 % by mole of D-lactic acid. In the case of a lactic acid/hydroxycarboxylic acid copolymer, degradability depends upon the content of lactic acid. A low content of lactic acid often leads to very slow or insufficient degradation when abandoned after use. Consequently, the content of lactic acid units is preferably 10 % by mole or more. Practically, a preferred composition of the lactic acid/glycolic acid copolymer comprises 30∼98 % by mole of lactic acid units and 70∼ 2 % by mole of glycolic acid units. A more preferred composition comprises 70∼98 % by mole of lactic acid units and 30∼2 % by mole of glycolic acid units. A preferred composition of the lactic acid/hydroxycaproic acid copolymer comprises 10∼98 % by mole of lactic acid units and 90∼2 % by mole of hydroxycaproic acid units. A more preferred composition comprises 20∼98 % by mole of lactic acid units and 80∼2 % by mole of hydroxycaproic acid units. The most suitable molecular weight and copolymer composition of the lactic acid base polymer used in the invention is arbitrarily selected from the above range so as to meet the longest adhesion time in respective use. According to the knowledge of the present inventors, poly(L-lactic acid) having a molecular weight of 150,000 or more can be applied to use-life of 6 months or more. Poly(L-lactic acid) having a molecular weight of 50,000 or more or poly(DL-lactic acid) having a molecular weight of 100,000 or more and comprising less than 5 % by mole of D-lactic acid can be applied to use-life of about a month. The above polymers and additionally poly(DL-lactic acid) comprising less than 25 % by mole of D-lactic acid units and a lactic acid/glycolic acid copolymer comprising less than 15 % by mole of glycolic acid units can be applied to use-life of from several days to a few weeks. Further, formed products which require high flexibility can be prepared, for example, from a lactic acid/hydroxycaproic acid copolymer comprising about 60 % mole of hydroxycaproic acid units. In the case. use-life of the formed product is about 3 months. In the case of preparing a lactic acid base polymer by direct dehydrating polycondensation of lactic acid and hydroxycarboxylic acid. the dehydrating condensation of L-lactic acid, D-lactic acid or a mixture of these acids, or the dehydrating condensation of L-lactic acid, D-lactic acid or a mixture of these acids and hydroxycarboxylic acid is carried out in a reaction mixture preferably containing an organic solvent and substantially in the absence of water. Any of L-lactic acid, D-lactic acid and a mixture of these acids can be used as the raw material of the lactic acid base polymer. The degradable resin composition of the invention can be obtained by mixing 100 parts by weight of a lactic acid base polymer with 0.001 ∼5 parts by weight, preferably 0.05∼5 parts by weight of one or more additives selected from ultraviolet absorbers and light stabilizers as defined in claim 1. When the amount of the ultraviolet absorbers and light stabilizers is small, weatherability in outdoor use of the formed product becomes poor, that is, acceleration of degradation by exposure to ultraviolet rays cannot be sufficiently inhibited. On the other hand, too much of these additives gives an adverse effect on the essential properties of the lactic acid base polymer. Consequently, the amount of these additives is preferably in the above range. Additionally, [2,2'-thiobis-(4-tert-octylphenolite)]-n-butylamine nickel and [2,2'-thiobis-(4-tert-octylphenolite)]-2-ethylhexylamine nickel are unsuitable for the degradable polymer of the invention because these compounds sometimes lead to a decomposition of the polylactic acid or the lactic acid/hydroxycarboxylic acid copolymer in the mixing step. Methods for preparing a degradable resin composition by mixing a lactic acid base polymer with ultraviolet absorbers and/or light stabilizers include a method for adding a prescribed amount of ultraviolet absorbers and/or light absorbers to the lactic acid base polymer and mixing with a mixer such as a ribbon blender and Henschel mixer in the vicinity of room temperature, a method for melting the lactic acid base polymer by heating to 100∼280 °C and kneading with a prescribed amount of ultraviolet absorbers and/or light stabilizers, and a method for dissolving the lactic acid base polymer and ultraviolet absorbers and/or light absorbers in solvents such as chloroform, methylene chloride. benzene, toluene. xylene, dimethyl formamide, dimethyl sulfoxide and dimethyl imidazolidinone and mixing the solutions thus obtained. The degradable resin composition of the invention can be mixed with a plasticizer, antioxidant, heat stabilizer, lubricant, pigment and other additives, if desired, in addition to the the above ultraviolet absorbers and light stabilizers as defined in claim 1. Plasticizers which can be used include, for example, di-n-octyl phthalate. di-2-ethylhexyl phthalate, dibenzyl phthalate, diisodecyl phthalate, ditridecyl phthalate, diundecyl phthalate, diisooctyl phthalate and other phthalate derivatives; di-n-butyl adipate, dioctyl adipate and other adipate derivatives; di-n-butyl maleate and other maleate derivatives; tri-n-butyl citrate and other citrate derivatives; monobutyl itaconate and other itaconate derivatives; butyl oleate and other oleate derivatives; glycerol monoricinoleate and other ricinoleate derivatives; tricresyl phosphate, trixylenyl phosphate and other phosphate esters; and other low molecular weight plasticizers and high molecular weight plasticizers such as polyethylene adipate and polyacrylate. In the above plasticizers, preferred plasticizers include glycerol triacetate (triacetine), lactic acid, lactide and lactic acid oligomers having a polymerization degree of 2 ∼10. The amount of a plasticizer which is added to the degradable resin composition is optionally selected depending upon the flexibility required for the formed product. Too large an amount of addition leads to unfavorable bleeding out on the surface of the formed product. Consequently, the amount of the plasticizer is preferably in the range of 1∼50, parts by weight, more preferably 5∼20 parts by weight for 100 parts by weight of the lactic acid base polymer. The lactic acid base polymer comprising the plasticizer is preferred to have low crystallinity in view of plasticizing efficiency and inhibition of bleeding out. Consequently, poly(D,L-lactic acid) or a lactic acid/hydroxycarboxylic acid copolymer is preferably used in the case of adding the plasticizer to the degradable resin composition. The lactic acid base polymers which are more preferably used in the presence of the plasticizer are poly(D,L-lactic acid) comprised of 50∼ 98 % by mole of L-lactic acid and 50∼2 % by mole of D-lactic acid. poly(DL-lactic acid) comprised of 50∼98 % by mole of D-lactic acid and 50∼2 % by mole of L-lactic acid, a lactic acid/glycolic acid copolymer comprised of 98 ∼30 % by mole of lactic acid units and 2 ∼70 % by mole of glycolic acid units and a lactic acid/hydroxycaproic acid copolymer comprised of 98 ∼10 % by mole of lactic acid units and 2-90 % mole of hydroxycaproic acid units. These polymers are effectively plasticized with the plasticizer and can inhibit bleeding of the plasticizer. The present invention will hereinafter be illustrated in detail by way of examples and comparative examples. Marketed L-lactide (hereinafter referred to as L-LTD). DL-lactide (D-isomer 50 moles/L-isomer 50 moles, hereinafter referred to as DL-LTD) and glycolide (hereinafter referred to as GLD) were purified by recrystallizing 4 times from ethyl acetate, respectively. Marketed ε-caprolactone (hereinafter referred to as CL) was purified by drying on calcium hydride and distillation. To a glass reaction vessel having a silane treated internal surface, the above L-LTD. DL-LTD. GLD, CL and a stannous octoate catalyst and a lauryl alcohol molecular weight controller were charged in amounts illustrated in Table 1 and Table 2. Lauryl alcohol was used in Preparation Examples 1 and 2. The mixture obtained was dried overnight under reduced pressure. 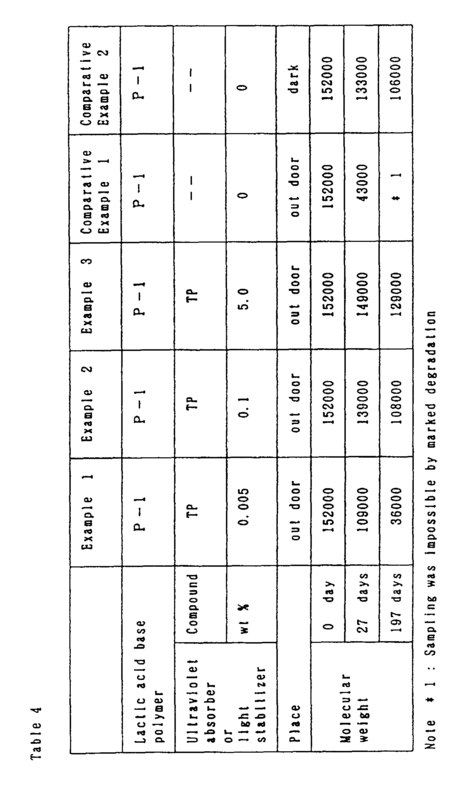 The reaction vessel was sealed under reduced pressure and the mixture was heated to the temperature illustrated in Table 1 and Table 2 and polymerized for a prescribed time. After finishing the reaction, the reaction mixture was dissolved in 20 times by weight of chloroform. The chloroform solution was poured into hexane having 5 times by weight of chloroform. Precipitated polymer was filtered and dried to obtain lactic acid base polymers P-1∼P-9. The molecular weight of the lactic acid base polymers thus obtained was measured by gel permeation chromatography (GPC) using chloroform as a solvent and calculated on the basis of reference polystyrene. Polymerization conditions and results of molecular weight measurements on these lactic acid base polymers obtained are illustrated in Table 1 and Table 2. To a reaction vessel equipped with a Dean Stark trap, marketed 90% L-lactic acid (hereinafter referred to as LA), 90% D-lactic acid (hereinafter referred to as DA). glycolic acid (hereinafter referred to as GA) and hydroxycaproic acid (hereinafter referred to as HCA) were charged in amounts illustrated in Table 3, respectively. The mixture was heated with stirring at 150 °C for 3 hours under 50 mmHg while distilling off water. Successively 6.2 g of tin powder was added and the mixture was further stirred at 150 °C for 2 hours under 30 mmHg to obtain an oligomer. To the oligomer, 28.8 g of tin powder and 21.1 kg of diphenyl ether were added and an azeotropic dehydration reaction was carried out at 150°C under 35 mmHg. Distilled water was separated from the solvent in a water separator and the solvent alone was returned to the reaction vessel. After 2 hours. the solvent which returned to the reaction vessel was changed to pass through a column packed with 4.6 kg of molecular sieve 3A before entering into the reaction vessel. The reaction was further continued for 40 hrs at 150 °C under 35 mmHg to obtain a polylactic acid solution. The solution was diluted by adding 44 kg of diphenyl ether and cooled to 40 °C. Precipitated powder was filtered, washed three times with 10 kg of n-hexane and dried at 60 °C under 50 mmHg. To the powder. 12.0 kg of 0.5 N aqueous hydrochloric acid solution and 12.0 kg of ethanol were added, stirred at 35 °C for an hour, filtered and dried at 60 °C under 50mmHg to obtain lactic acid base polymers P-10 ∼P-13 in the form of powder. The yield was about 85 %. P-10 ∼ P-13 thus obtained were dissolved in chloroform and the molecular weights were measured by GPC (polystyrene converted). Similarly, P-10 was dissolved in acetonitrile and measured by high performance liquid chromatography (HLC). The residual monomer content in the polymer was 0.2 % by weight. Polymerization conditions and molecular weights of the lactic acid base polymers thus obtained are illustrated in Table 3. To 1.8 kg of L-lactide in a reaction vessel. 1.0 kg of an aqueous lactic acid solution having a concentration of 87 % by weight was added and heated at 100°C for 2 hours. After cooling the reaction mixture to room temperature, a transparent and viscous liquid was obtained. The oligomer thus obtained was dissolved in chloroform and molecular weight distribution was measured by GPC. Lactic acid and lactic acid oligomer was contained in the liquid reaction product. The average polymerization degree was 2.8. The product will hereinafter be referred to as LA-oligomer. P-1, P-4 and P-5 which were obtained in the preparation examples were individually dissolved in chloroform in a concentration of 10 % by weight. To the solution, 2-(2'-hydroxy-5'-methylphenyl)benzotriazole (hereinafter referred to as TP). 2-hydroxy-4-n-octoxybenzophenone (hereinafter referred to as HOB) or 4-dodecyloxy-2-hydroxybenzophenone (hereinafter referred to as DHB) were individually added in the prescribed amount illustrated in Table 4. Table 7 or Table 8. The mixture was thoroughly mixed and the resulting solution was cast on a glass plate and dried in the air. Successively, the solvent was completely removed by drying under reduced pressure to obtain a transparent film having a thickness of 100 µm. P-2 and P-3 which were obtained in the preparation examples were melt-kneaded at 220 °C in a Brabender Plastograph. Bis(2,2,6,6-tetramethyl-4-piperidyl)sebacate (hereinafter referred to as HAL). TP or 2-(2'-hydroxy-3',5'-di-tert-butylphenyl)benzotriazole (hereinafter referred to as T-320) was respectively added in the prescribed amount illustrated in Table 5 and Table 6 while melt-kneading P-2 or P-3. Polymer compositions thus obtained were hot-pressed at the temperature illustrated in Table 5 and Table 6 under a pressure of 50 kg/cm2 to obtain transparent films having a thickness of 0.5 mm. In Examples 1∼3 and Comparative Example 1. the film was allowed to stand outdoors by fixing at a place in the sun (the condition will hereinafter be simply referred to as outdoors). In Comparative Example 2, the film was allowed to stand outdoors in a covered box so as to prevent direct rays of the sun and exposure to rain (the condition will hereinafter the simply referred to as dark). A portion of the film was cut on the 24th day and the 44th day. The molecular weight of the cut piece was measured by GPC. Decomposition was distinctly inhibited in polymer compositions with addition of TP (Examples 1 ∼3) as compared with a composition which was allowed stand outdoors without addition of TP. Particularly, Examples 2 and 3 exhibited almost the same level of decomposition as in the dark (Comparative Example 2). Results are illustrated in Table 4. In Example 4 and Comparative Example 3, the films were allowed to stand outdoors as in Example 1. In Comparative Example 4, the film was allowed to stand in the dark as in Comparative Example 2. The tensile strength was measured for the films after a prescribed number of days had passed. The results are illustrated in Table 5. In Example 5 and Comparative Example 5, the films were allowed to stand outdoors. In Comparative Example 6, the film was allowed to stand in the dark. The tensile strength was measured for the films after a prescribed number of days has passed. The results are illustrated in Table 6. In Example 6 and Comparative Example 7, the film was allowed to stand outdoors. In Comparative Example 8, the film was allowed to stand in the dark. The molecular weight was measured by GPC after 3 months for the films. The results are illustrated in Table 7. In Example 7 and Comparative Example 9, the films were allowed to stand outdoors. In Comparative Example 10, the film was allowed to stand in the dark. The molecular weight was measured by GPC after 2 months for a portion of the films. The results are illustrated in Table 8. 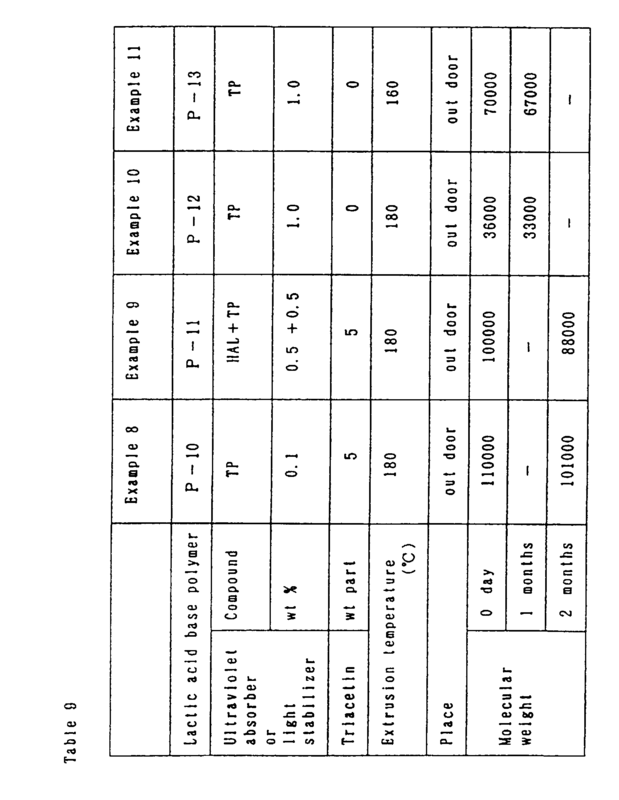 The ultraviolet absorbers illustrated in Table 9 were individually added to P-10 ∼ P-13 which were obtained in the preparation examples. and mixed with a Henschel mixer at room temperature to obtain lactic acid base resin compositions containing the ultraviolet absorbers. Successively, triacetin was added as a plasticizer to the lactic acid base resin compositions prepared from P-10 and P-11 in the amount illustrated in Table 9, and mixed with a Henschel mixer at 180°C to obtain lactic acid base resin compositions containing ultraviolet absorbers and the plasticizer. The lactic acid base resin compositions thus obtained were pelletized with a twin screw extruder. The pellets obtained were melt-extruded with a single screw extruder to obtain a film having a thickness of 150 µm. Decomposition of the films obtained was measured by the same method as carried out in Example 7. However, the films were allowed to stand for a month in Examples 10∼11. Formulations, extruding temperatures and molecular weight change are illustrated in Table 9. The ultraviolet absorbers illustrated in Table 10 were respectively added to the lactic acid base polymers P-5 ∼ P-9, mixed with a Henschel mixer at room temperature to obtain lactic base polymer compositions containing the ultraviolet absorbers. Successively, triacetin was added to the compositions obtained from P-7 and P-8. and the LA-oligomer obtained in Preparation Example 6 was added to the composition obtained from P-9, respectively as a plasticizer in the proportion illustrated in Table 10. These mixtures obtained were blend with a plastomill at 150 °C in P-7 and P-8 and at 130 °C in P-9. Sheets having a thickness of 1 mm were prepared by pressing these compositions thus obtained under a pressure of 50 kg/cm2 at 210 °C in P-6. 150 °C in P-7 and P-8. 130 °C in P-9, and at 100 °C in P-5. Successively, these sheets were individually deeply frozen with liquid nitrogen and crushed with a hammer mill to obtain granules of the lactic acid base polymer composition. These granules were successively melt-extruded with a single screw extruder and delivered through a T-die at the temperature illustrated in Table 10 to obtain lactic acid base polymer films F-1 ∼ F-5 having a thickness of 110 ∼ 120 µm. Formulations, extruding temperature and thickness of these films are illustrated in Table 10. The films thus obtained were buried in soil at a depth of 20 cm for 12 months. Thereafter the molecular weight retention rate was measured by the following method. The results are illustrated in Table 11.
molecular weight immediately before preparation. molecular weight after burying in soil for 12 months after use. The tensile strength at break of the film obtained in Example 13 was measured at a pulling rate of 50 cm/min. The tensile strength was 4.6 kgf/mm2. A resin composition containing 100 parts by weight of polyvinyl chloride having an average polymerization degree of 1100, 35 parts by weight of dioctyl phthalate, 2 parts by weight of a complex stabilizer, 0.05 parts by weight of the ultraviolet absorber TP and 1 part by weight of a complex fatty acid amide (stearylamide : palmitamide = 7 : 3 by weight) was melt-processed with a calender to obtain a plasticized polyvinyl chloride film having a thickness of 100 µm. The film was buried in soil for 12 months. Thereafter the film was dissolved in tetrahydrofuran, and the molecular weight retention rate was measured by GPC as carried out in Example 12. The results are illustrated in Table 10. A degradable resin composition comprising 100 parts by weight of a lactic acid base polymer and 0.001 to 5 parts by weight of one or more additives selected from the group consisting of 2-hydroxy-4-n-octoxybenzophenone, 4-dodecyloxy-2-hydroxybenzophenone, 2-(2'-hydroxy-5'-methylphenyl)benzotriazole, 2-(2'-hydroxy-3',5'-di-tert-butylphenyl)benzotriazole, and bis(2,2,6,6-tetramethyl-4-piperidyl) sebacate. The degradable resin composition of claim 1 wherein the lactic acid base polymer is one or more polymers selected from polylactic acid and a lactic acid / hydroxycarboxylic acid copolymer. The degradable resin composition of claim 1 or 2 wherein the lactic acid base polymer has a molecular weight of 30,000 to 500,000. The degradable resin composition of claim 2 or 3 wherein the polylactic acid is one or more polymers selected from poly(L-lactic acid) or poly(DL-lactic acid) having 50 to 100 % by mole of L-lactic acid units, and poly(D-lactic acid) or poly(DL-lactic acid) having 50 to 100 % by mole of D-lactic acid units. Thedegradable resin composition of claim 2 or 3 wherein the lactic acid / hydroxycarboxylic acid copolymer is one or more polymers selected from a lactic acid / glycolic acid copolymer having 30 to 98 % by mole of lactic acid units and 70 to 2 % by mole of glycolic acid units, and a lactic acid / hydroxycaproic acid copolymer having 10 to 98 % mole of lactic acid units and 90 to 2 % by mole of hydroxycaproic acid units. A degradable resin composition of any of the claims 1 to 5 which comprises 1 to 50 parts by weight of one or more plasticizers selected from glycerol triacetate, lactic acid, a lactic acid oligomer having a polymerization degree of 2 to 10, and lactide for 100 parts by weight of the lactic acid base polymer. BRPI0923725A2 (en) * 2008-12-30 2015-08-04 Novartis Ag "Trifunctional UV absorbing compounds and use thereof". MX2012003140A (en) * 2009-09-15 2012-04-20 Novartis Ag Prepolymers suitable for making ultra-violet absorbing contact lenses. MX2013003905A (en) 2010-10-06 2013-06-03 Novartis Ag Water-processable silicone-containing prepolymers and uses thereof. DE3738786A1 (en) * 1987-11-14 1989-05-24 Belland Ag In aqueous alkali dissoluble adhesive film as label and the like. Owner name: MITSUI CHEMICALS, INC.